REK and RAH consist of 38 children; our teachers are Miss Kyle and Miss Hopper and our higher learning teaching assistant is Mrs Fulton-Wren. This half term, we are looking forward to learning all about our favourite stories written by the author, Julia Donaldson. We will be exploring a woodland theme, such as the Room on the Broom, Stick Man, the Gruffulo and the Gruffulo’s Child. 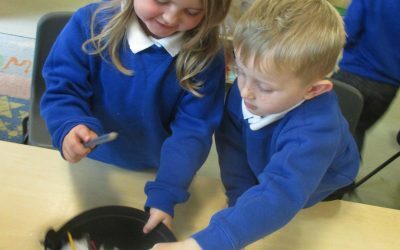 We will be exploring Forest school further, through making magical potions, finding the Gruffulo and describing snowy, winter scenes. We continued to celebrate Chinese New Year this week-check out what we’ve been doing! We created our own lanterns, listened to the story of the Great Race, wrote our names using Chinese writing and we even had fun in the Chinese restaurant role-play area! In maths this week, we were able to find doubles up to 10. We were able to select and count out the correct number of counters from a large group. 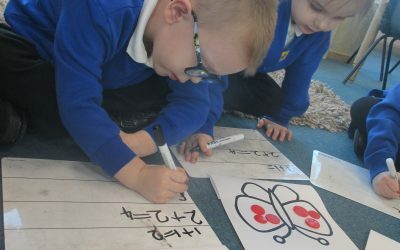 The children were then able to place the same number of counters on each butterfly wing to find the total number. We were able to write the corresponding number sentence to match the representation. Well done everyone! Kung Hei Fat Choy! 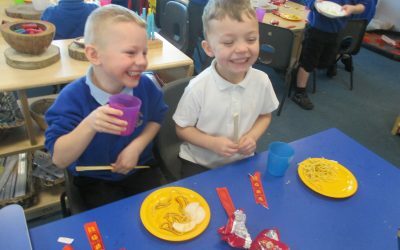 We have been celebrating Chinese New Year by having a special feast! 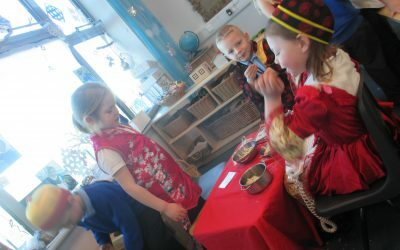 We learnt about more about Chinese traditions which are celebrated in China, sang songs and had a dragon dance to celebrate their special festival. Did you know Chinese New Year is also known as Spring festival? 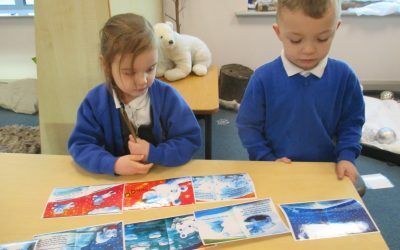 This week, we learnt about the Northern lights and discussed the various countries in the Arctic circle. 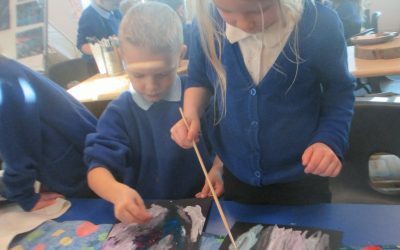 We explored using a range of paints, mixing colours and creating textures when creating our artwork. 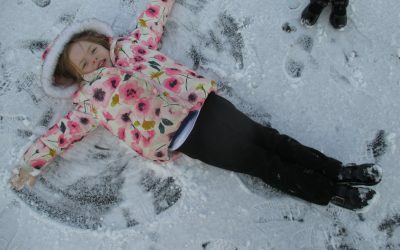 What a wonderful surprise we had today when it snowed! 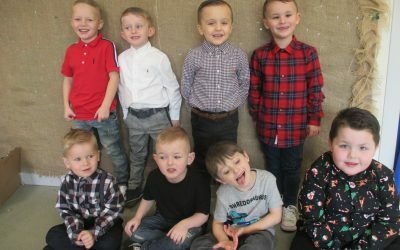 Take a look at the fabulous photographs below. This week, we listened to the story, ” The Polar Bear and the Snow cloud.” We discussed how the characters felt in the story and we talked about our own feelings. We discussed friendships and came up with our own strategies to be a good friend to others. 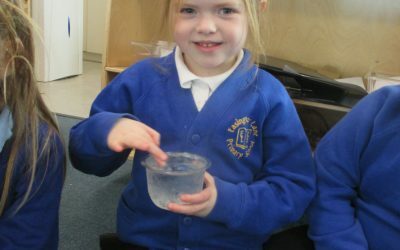 This week, we investigated the process of melting and freezing. We explored what happened to water and melted chocolate when we put it in the freezer. We discussed what happened when we took it out the freezer too! 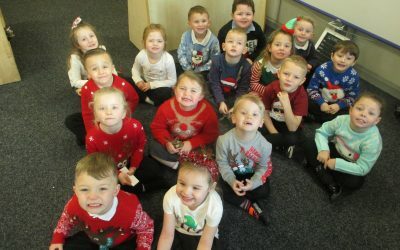 Reception had a fantastic Christmas Party this afternoon. There was dancing, games and lots of laughs! Check out our photographs below! On Friday, it was Christmas jumper day! We had a great day of Christmas crafts, games and we even had Christmas dinner (the best part!) Take a look below at our colourful Christmas jumpers and I think you’ll agree we all look fabulous! A surprise from Stanley the Elf! This week, Stanley the Elf left a surprise for Reception and Nursery in Forest school! 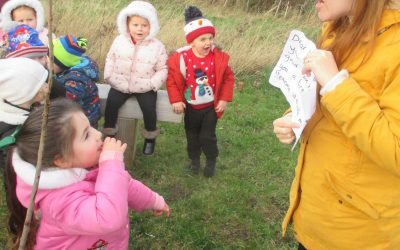 We explored the grounds looking for any clues and we saw the most beautiful Christmas tree, alongside decorations which Stanley had left for us to use. We helped to bring the tree back to the class where we were able to use our creative skills to decorate it! We had lots of fun! We listened to the Julia Donaldson story, “Room on the broom” this week. We sequenced the story, recalled the main events and made our own spooky magical potions! 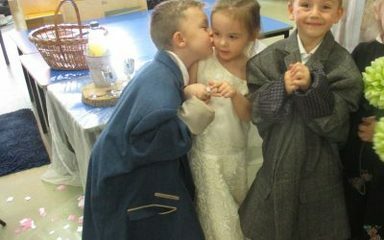 This week, we enjoyed listening to the “Scarecrow’s wedding” story, written by Julia Donaldson. We decided to have our very own wedding celebration, including our very own bride and groom, bridesmaids, groomsmen and wedding guests. We even had a disco, party food and a dance to celebrate!